The two women accused of killing the half-brother of North Korean leader Kim Jong-un were taken back to the scene of the crime on Tuesday as their murder trial moved from the courtroom to the Malaysian airport for a three-hour inspection tour under heavy police guard. 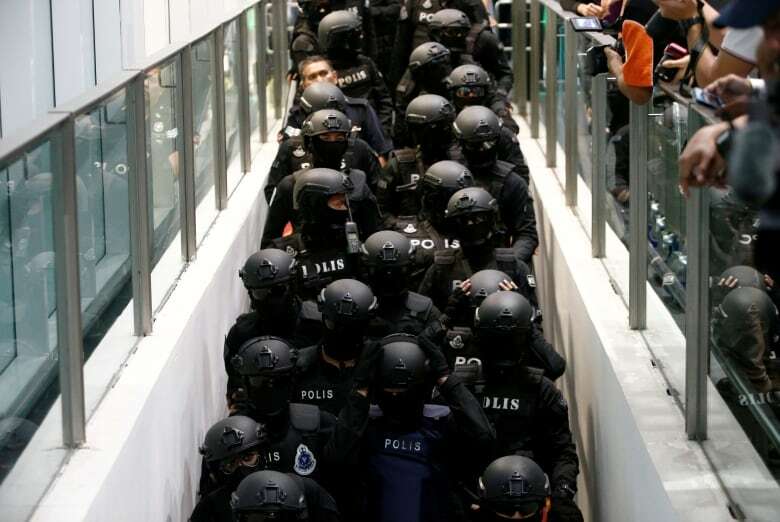 The judge, prosecutors, defence lawyers and representatives of the women's home countries were escorted inside the Kuala Lumpur airport by heavily armed police on a tour meant to give the court a better perspective of events as they unfolded in Kim Jong-nam's death. Indonesian Siti Aisyah and Doan Thi Huong of Vietnam appeared subdued at the start of the tour, which took a break about an hour later when Aisyah became emotional. She was seen sobbing quietly. She and Huong were given water to drink, and when the tour resumed, both were being pushed around in wheelchairs. Aisyah's lawyer, Gooi Soon Seng, said the women, who were wearing heavy bulletproof vests and handcuffed, were given wheelchairs because they complained of exhaustion. High Court Judge Azmi Ariffin visited the check-in kiosk in the budget terminal where the two women allegedly smeared VX nerve agent onto Kim Jong-nam's face on Feb. 13. The judge followed the path Kim walked to the airport clinic seeking help and retraced the movement of the two women, who were seen on security footage rushing to restrooms afterward to wash their hands. Security videos of the killing were shown at the trial earlier this month, and "the exercise today is to see for ourselves the actual locations and which cameras recorded the scenes," Gooi said. "I believe the visit to the crime scene will help strengthen the prosecution's case because it will allow the judge to follow the women's trail and understand why they took that path," prosecutor Wan Shaharuddin Wan Ladin told The Associated Press before the tour began. Police clad in black uniforms, many carrying rifles and wearing masks, formed a security ring around the group as they toured the busy airport for more than three hours. Officials said the trial will return to the courtroom on Wednesday, with cross-examination of the police investigating officer. 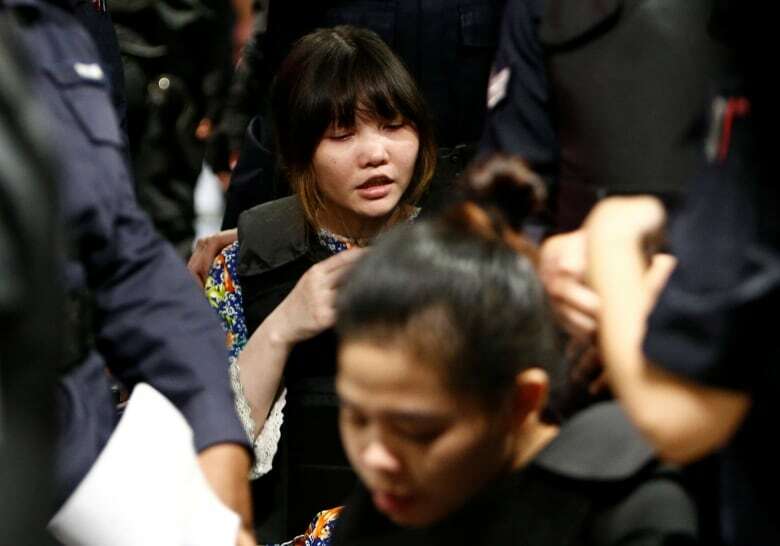 Huong and Aisyah, who have pleaded not guilty, are the only suspects detained in the brazen assassination of Kim Jong-nam, an outcast from North Korea's ruling family who lived abroad in virtual exile for years. Their defence lawyers have said the women were duped by suspected North Korean agents into believing they were playing a harmless prank for a TV show. Prosecutors contend the women's conduct showed that they knew they were handling poison. South Korea's spy agency has claimed the attack was part of a carefully set plot by Kim Jong-un to kill a brother he reportedly never met. Kim Jong-nam was not known to be actively seeking influence over his younger brother, but had spoken out publicly against his family's dynastic rule and because he was the eldest son of the late leader Kim Jong-il he could have been seen as a potential rival to Kim Jong-un. Since the trial opened Oct. 2, witnesses have testified that Kim died from acute VX poisoning, and that the banned chemical agent was found on his face and clothing, and on the women's clothing and Huong's fingernail clippings. A chemical weapon expert has also told the court that VX can be safely removed by careful washing within 15 minutes of exposure.